IRVINE, CA--(Marketwired - Mar 20, 2014) - Toshiba America Information Systems Inc., Telecommunication Systems Division (Toshiba -- www.telecom.toshiba.com) has helped Phoenix Manufacturing Inc. (PMI -- www.evapcool.com) meet its communication goals with a new Toshiba IPedge® IP-based business telephone system. Based in Phoenix, PMI is a designer, manufacturer, and distributor of evaporative cooling products designed for the comfort of residential and business environments. Incorporated in 1975, PMI has nearly 40 years of experience in business, serving the HVAC industry with a promise of delivering high-quality products and services. "Toshiba's IPedge IP business telephone system has exceeded our expectations by helping us improve our unified communications capabilities with a system that literally is paying for itself with cost savings," said Ruth Roman, controller, Phoenix Manufacturing Inc.
Providing a reliable business telephone system that is affordable while delivering cutting-edge technology features with a fast return on investment. Chris Corbett, president of Authorized Toshiba Dealer Cortel Communications (www.CortelCom.com) based in Phoenix, recommended Toshiba's IPedge. "We recommended Toshiba's IPedge because we knew it would exceed PMI's objectives," he said. Enterprise Manager for simple, browser-based administration and remote management. Using Toshiba's Call Manager Unified Communications application, PMI's staff has been able to improve their communication by using UC features, including call-handling capabilities such as Click-to-Dial from their database; Presence to see staff availability; Chat instant messaging for quick, internal communication; tracking calls; and taking notes on a call. Toshiba's IPedge met PMI's requirement for an affordable, richly featured business telephone system that helped improve communication both internally and externally. Toshiba's ACD with TASKE reporting and OAISYS® Tracer call recording help keep customer service at its optimal level. As well, Unified Messaging helps users stay connected with all email, voice mail and faxes coming into a single inbox accessible from their desk phones or smartphones. With Toshiba's browser-based Enterprise Manager, the IT manager can remotely make moves, adds, changes and global updates to all the IP telephones on the IPedge systems quickly and easily. Toshiba's IPedge IP business telephone system exceeded PMI's communications objectives, including greatly improving staff communication by using Toshiba's Call Manager Unified Messaging application while delivering a fast return on investment by eliminating costly telephone lines and implementing a fully IP-based business telephone system. Cost savings by moving to an affordable IP system with a fast return on investment. "With Toshiba's IPedge, PMI's users are empowered to communicate more effectively, be more efficient, and have greater access to their customers, partners and each other," said Corbett. Toshiba America Information Systems Inc., Telecommunication Systems Division is one of the three business units of Toshiba America Information Systems Inc. (TAIS) and offers business communication solutions for SMB enterprises and enterprises with multi-site or regional locations. Toshiba's VIPedge cloud-based business telephone solution supports up to 500 users, and the IPedge and Strata CIX systems support from 8 to 1,000 users and offer Voice over IP, voice mail and unified messaging, conferencing and collaboration, unified communications applications, networking, mobility and more. Together with Toshiba's PCs, tablets, copiers, and surveillance video cameras/recorders, Toshiba's Telecommunication Systems Division helps enterprises maximize business efficiency in communications and mobility. Headquartered in Irvine, Calif., TAIS is an independent operating company owned by Toshiba America Inc., a subsidiary of Toshiba Corporation. For more information, visit www.Telecom.Toshiba.com. © 2014 Toshiba America Information Systems Inc. All rights reserved. All product, service and company names are trademarks, registered trademarks or service marks of their respective owners. Information including, without limitation, product prices, specifications, availability, content of services, and contact information is subject to change without notice. 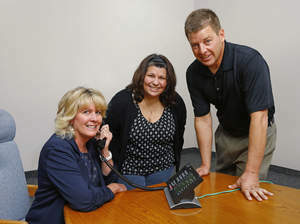 From left, Ruth Roman and Cindy Meadows of Phoenix Manufacturing with Chris Corbett of Cortel are pleased with the Toshiba IPedge system that provides robust Unified Communications, contact center solution and remote system administration.